I was lucky to be one of the test knitters for Ririko's Jaunty, the first skirt I've ever knit! It was such a joy to knit that I finished well ahead of the deadline. I knit mine with Wollmeise Pure and Twin, and ended up choosing somewhat conservative colors, which I'm quite happy with. It's an easy pattern, and there is no reason to be intimidated by a skirt; it's easier to knit than the average sweater. The only "unusual" thing you'll need is a rubber band for the waist. 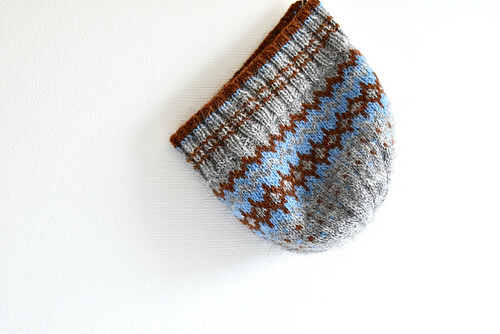 The knitting is mindless stockinette stitch for the most part, with some increases. I definitely recommend! This lovely hat pattern from Trin Annelie practically turned into a large Létt-Lopi swatch, because I still have issues combining stranded knitting with other kind of stitches in a single project, at least when it's something that also needs to fit my larger than average head. Even after semi-aggressive blocking the stranded knitting section is too tight, while the hat overall is too long. But that's OK; I accept that not every project turns exactly the way I visualized it, particularly when working with unfamiliar yarn (SO different from the yarns I usually work with) without swatching. I'm aware this is the price I pay when I want to keep my hobbies spontaneous, no meticulous planning required if I don't feel like it. One thing I am quite happy with is the color combination, and I have some more experimentation left to do with Létt-Lopi. 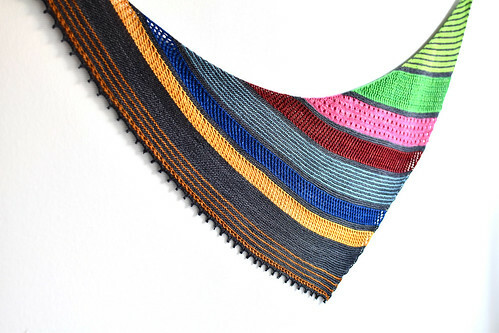 Lisa Hannes' Take It All mystery shawl KAL was fun to knit, I'm just not completely happy with my color choices. In hindsight, something more harmonic, for example some kind of a gradient, would probably have been better. The pattern was very well written, I'm especially a fan of Lisa Hannes' charts. I hope she keeps writing mystery patterns along regular ones, and I believe they will turn out to be quite popular, because she's already such a pro at pattern writing!